Well, you know, there's a good discussion topic. What about this notion of having a silly low Bb off by itself? How many North Americans play old Mechelen-school music today? But, that's another topic! I'll start one - in the repertoire section! Terry hasn't made it clear whether there is money to do something with the Bathurst instrument, so I am less inclined to start with such a grandiose enlargement. CarlSZimmerman wrote: Excellent photos and descriptions! The arrangement of the original bellows action is reminiscent of what I found in the tower at Lincoln, Nebraska, in 1965. The bellows themselves were long gone (Ron Barnes had ripped out the whole mechanism many years earlier), but the remains of the cabinetry and the frame for the bellows rack were there above the baton keyboard. If Terry were to open the two large doors above the piano-style keyboard, I'd expect to find the bellows space painted flat black on the inside. Thanks for the nice comments, Carl. Yes, indeed, matt black inside. I'll attach an image. It shows me compressing one of the bellows, as if it had been sucked dry by the vacuum from the keyboard. That would normally have pulled down that square block just below the forked piece I'm pushing, and that would have pulled the clapper up to the bell. The blocks have all fallen down as the transmission system was removed from just above the umbrellas upwards. Yes, I'm very conscious of the debt we owe to the generation that built the tower and bought the existing stuff. A feat more remarkable when we remember that these were the depression years, and many that had returned from war were just wanting to forget all that. Very humbling. In terms of funding, there appears to be enough to get the instrument up and running, but not enough to do what we would all like to do given unlimited funds. My feeling is that we should get it up and running in a fairly minimalist way, to break once and for all through the barrier that has dogged the installation from the start. Then I'm sure it will take on a life of its own. But when I say minimalist, I don't want to cut off desirable future options. EG, buying a three octave clavier (to suit the existing bells) would seem like a very short-sighted policy, hence this discussion. In that context, allowing for a future Bb bell would seem to require just a slightly wider clavier and may be cheap future-shock insurance. I'll certainly take it on board and look forward to further discussions. Actually capitalising on the extra clavier range would be sobering - we'd need a Bb, C, Eb and F (and maybe a C#) to fill in the bass end. Anyone bought a big bell lately and can report on the price? One could always realise a synthetic extension to the range with MIDI (and some really big speakers!). Anyone know of such an installation? Perhaps in a travelling instrument? As a strategy, it might backfire. If it worked really well, nobody would be moved to raise the extra money for real bells. If it worked poorly, nobody would be moved to raise the extra money for real bells. Hmmmm. Oh Terry, Please make room for a low Bb! It would provide so many more playing options! I have fallen in love with the Bb-octatonic scale, even though I have to play it an octave higher. My 2-octave carillon has an extra C# and D on top and that gives me the D-octatonic(or F or Ab). our low Eb was given much later in 2001 by one local lady in memory of her mother. When you get your beautiful carillon playing, someone out there might be moved to give you a low Bb! I have a topic up in the repertoire section about having the isolated low B-flat, which I think is a ridiculous idea. The history behind that notion is explained there, so no need to repeat it here except to say that it makes no sense on a keyboard instrument, in general terms, to base the range on a "black-key note." I'm all for adding bass bells, but let's fill in the chromatics and bring it to concert pitch. Remember the obvious - adding a C that is keyed to Bb will add grandeur to the few odd pieces that use low Bb, but will continue to trivialize everything else that is played. Adding a few bass bells, bringing it to concert pitch, and completing the chromatics will benefit everything that is played on it. I have never heard oof anyone attempting to add bass notes via a bongatron (we use the term for fake bell sounds, rather than for electric strikers). Terry, that is a ghastly idea, sorry! How would you ever produce such a thing and make it respond as real bells do to variations in touch nuance (not just dynamics)? 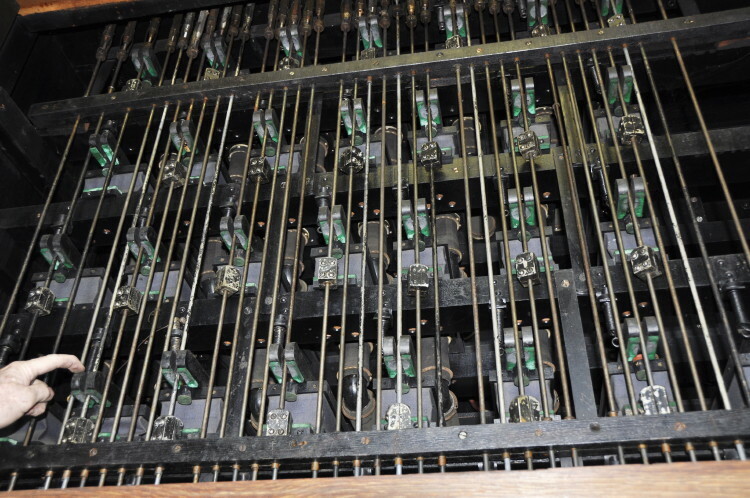 Moreover, a carillon is a durable instrument, good for hundreds of years. The life expectancy of a bongatron is usually 25 years. Probably the biggest challenge would be making it feel real on the clavier. There would be no technical need for the batons and pedals to feel heavier than at the treble end, but that would surely disconcert a carillonist used to playing heavy bass notes. I can imagine it messing with timing as the low notes plummet unexpectedly to the bottom of the slot! So the synthesised keys would need artificial weighting and ideally synthesised inertia. Joey Brink's analysis of the haptics of existing carillons puts figures on it. But surely someone, somewhere has done this before? What do travelling carillons do for a low end? Traveling carillos are just pitched higher - usually an octave higher. You will never convince me that this is a good idea. Much money and research has gone into digital 32' organ stops, but few are really convincing - none really are in the long run. We made many upgrades to our organ (now 59 ranks), and I never considered digital anything. We do have two terrific resultants! As for the idea on a carllon - just don't do that for a really essential note! You want the silly thing to , go down to low G, OK, but at leats let's have all bells down to and including low C. Now think, Terry, you could fake a flute digitally, but would you ever consider that a viable alternative to a real flute? Heh heh, I'd have to admit that MIDI flute is one of the worst of the MIDI implementations. I did see a chap with a breath controller added to a Yamaha MIDI keyboard, and he could do surprisingly realistic woodwind emulations. But why bother! It's a good point to separate essential notes, eg C up from what might be regarded as luxury notes. (The precise definition of luxury perhaps being linked to what the owner can afford, rather than an absolute value). Total use of synthesized bells in period: 75,134. Usage figures like that would have to impress the bean-counters! Each year that passes, the numbers get bigger, further strengthening the case. And I'm sure we could rely on John to give a scathing assessment of how the mix of real and synthesised bells sounds and feels, and how any city should feel embarrassed to permit such an abomination! That is NOT what I wrote, which was "concert pitch in Bb"; but perhaps if I had written "concert pitch from Bb" it would have been clearer. Even if the modern carillon repertoire only rarely calls for a bass Bb, that would make a splendid hour bell for a clock strike. And even if it's too expensive for current economic conditions, simply presenting it as a theoretical possibility might help to encourage choosing the moderate option over the minimal option, or the minimal option over doing nothing. Carl, I was reacting more to the general emphasis (which I consider unwarranted) on having a low B-flat. In general, as one who composes and improvises, I'd rather have low C# than low Bb. Is not the musical instrument aspect more important (at least to us) than the clock bell function? Terry, I suspect that your intimate knowledge of flutes influences your view that they can be sythesized convincingly. For me, the carillon is the same.